Those vignettes are nicely composed and will be cool when painted. The face colors on the Captain look really good. I'm very happy with your comments as it was my intention to keep the mousesmasher on the more "jolly" side while with the Kriegcommander I wanted to portray a very dark and gray atmosphere of a possible far, far away future for mankind. Well, I always keep my eyes open for stuff I can use with my models, you would be surprised by how many things are usefull for us. Or as my wife would say ; more trash to put on the heap!!! Thank you very much for your nice comments. I always have enjoyed painting faces the most. 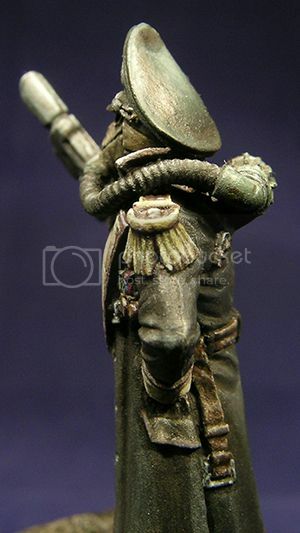 I'm realy new at fantasy miniatures, but I have been painting historical figures for the best part of the last 15 years. Today we finally had a couple hours of sunshine here in Belgium, no it's rain and lightning and thunder, so I could work with the balsa foam. The rough forms of the wall for the brass monkeys are completed, now I need to stamp all the brick and add details? For the road I'll try a textured rolling pin, also for the first time in my life! Nice stuff going on here. Seems like I missed that rackham one. And I am totally into rackham minis... There's still nothing like those miniatures around. Such a beautiful and unique style to them. You did a great job and totally matched the style with your scene. 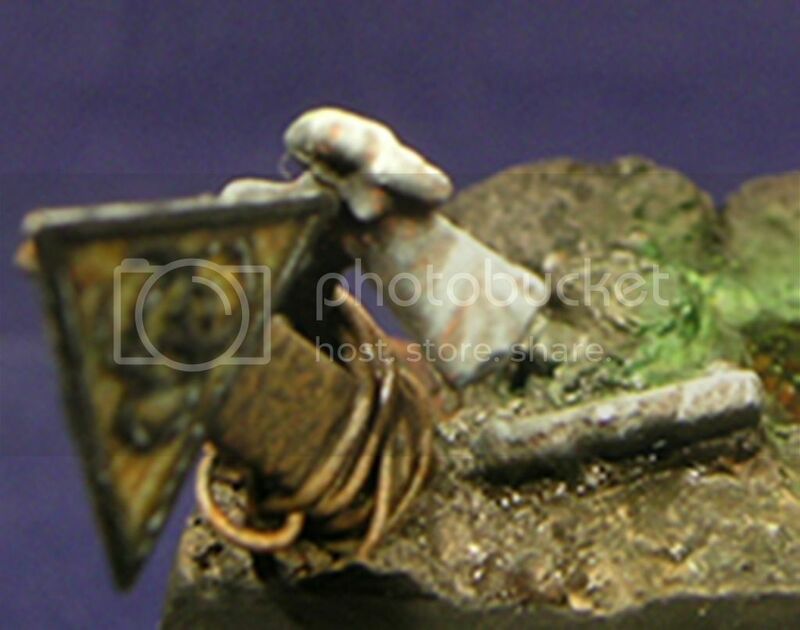 Realistic miniatures is nothing I am into, I can appreciate a good paintjob on them, but I don't feel like giving critique about them. Your next fantasy projects look like they are going to be winners as well. Very promising start. Miniature Exchange. Join the fun! Would you mind voting? Here's my Gallery, C'mon ev'rybody! As everyone else, I'm really impressed with the quality of the projects you're working on. 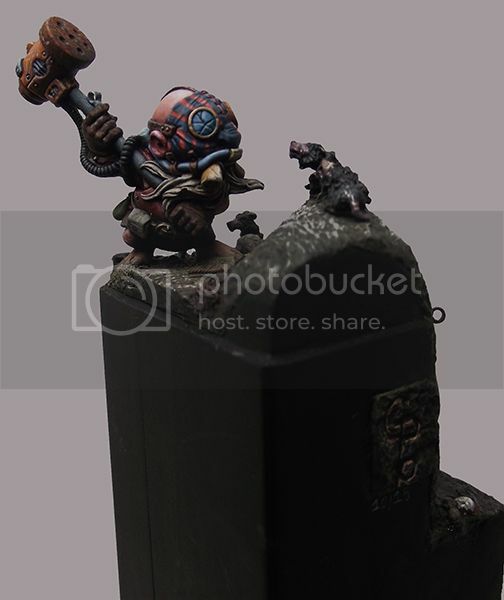 I love the dwarf rat-smasher, lovely paint-job on an awesome figure and the base really tells the story. I feel your pain though on the pics. What do you use for a camera now? I was away from painting (and WIP photos) for several years, and one of the best improvements in that time was that a simple iphone camera now can take good quality pics if you have a decent light source. 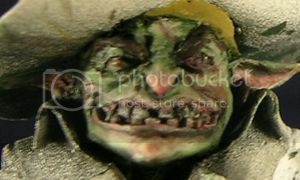 Your absolutely right about ther Rackham figures. 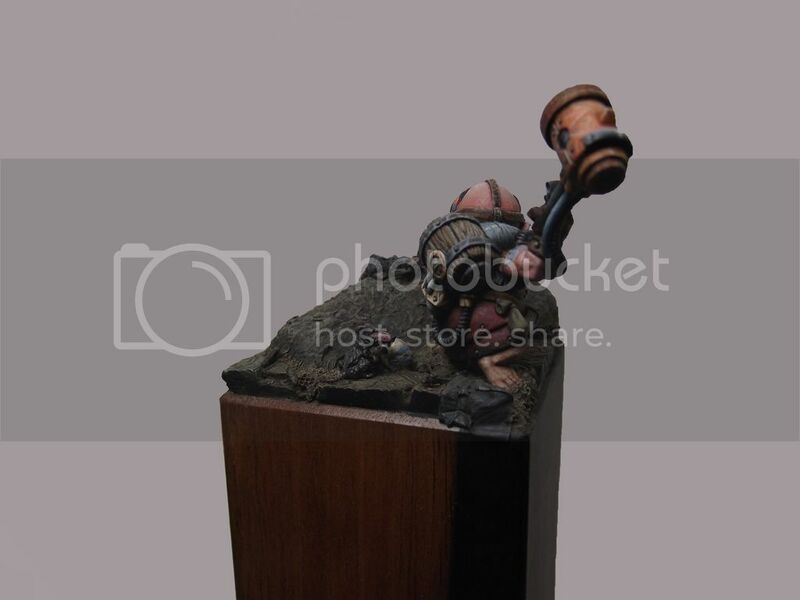 BTW, there the reason I started painting fantast in the first place. 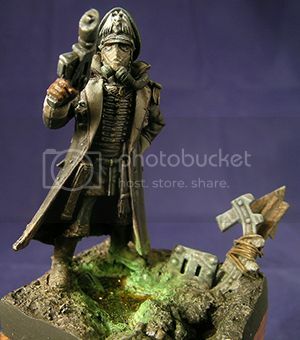 It's a pitty for a newbie like me ther so hard to find, although I managed to buy around 200 of them, way more then what I can paint in my life, there are still a couple of dozen I would like to add to my collection. Have you seen the mini's by Big Child creative? 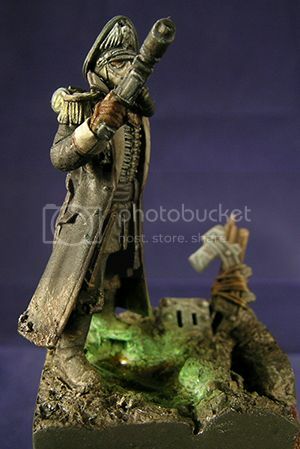 They evoke about the same feeling with me as the Rackham figures. There are many little details sculpted for us to discover and for some reason I do find a kind of "humor" in them which I found in the Rackham one's? Well, historical is what I grew up with in this hobby, have been painting them for about 15 years now, so I fear that from time to time you might see one here. Thank you very much for your nice comments. Such comments are, to me, worth more than any award at a show. I'm using a Coolpix 5400 by Canon on a tripod, two daylight bubbles (used to use 3 before I got a lighttent). I'm still one of those old skool guys who uses a plain gtsm instead of a smart phone. All that I want from my portable phone is to be able to my calls with it. I never reply on SMS as the way the dials are positioned on the phone are completely unlogical to me, so it takes me very, very long to write a message. Back in the day whan I replied only to SMS from my wife, I once got so enerved with it that I threw my phone to bits against a wall. Since then I don't have to answer the wife anymore, but I also don't get an expensive gsm either. Not that I care about it though. Yeah, not the cheapest. 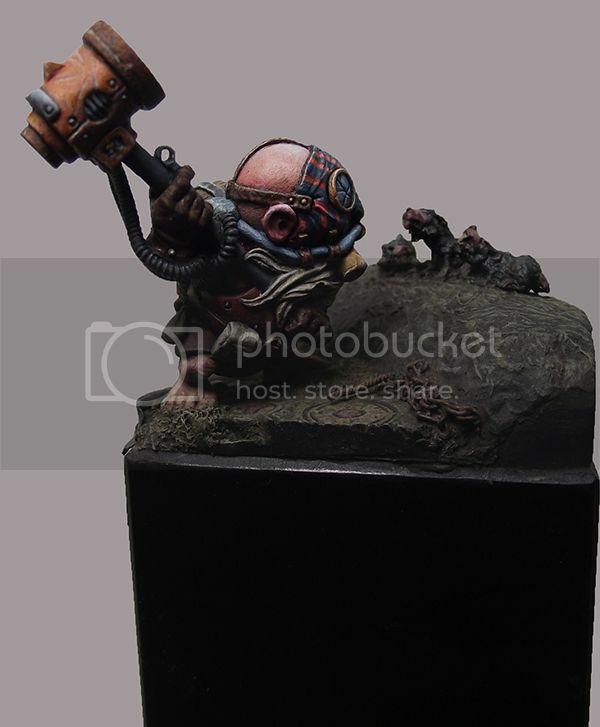 But then again the models are very big so you get some huge clumps of resin! Anyhow, I rather pay some more for a figure I really adore, and have felt in love with, then a bit less for "just" a good figure. 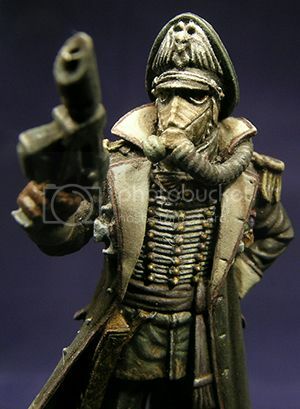 I think that 25 euro's for a plastic 28mm figure, that's what we pay in Belgium for a GW figure, is much more expensive. For that amount of money I'll get 2 fourthymm from BC to name but one, or 1 exquisite resin figure by Kingdom Death. BTW, I have no financial or any other interests with these companies or any others. The models by Twisted are also very, very good I think. 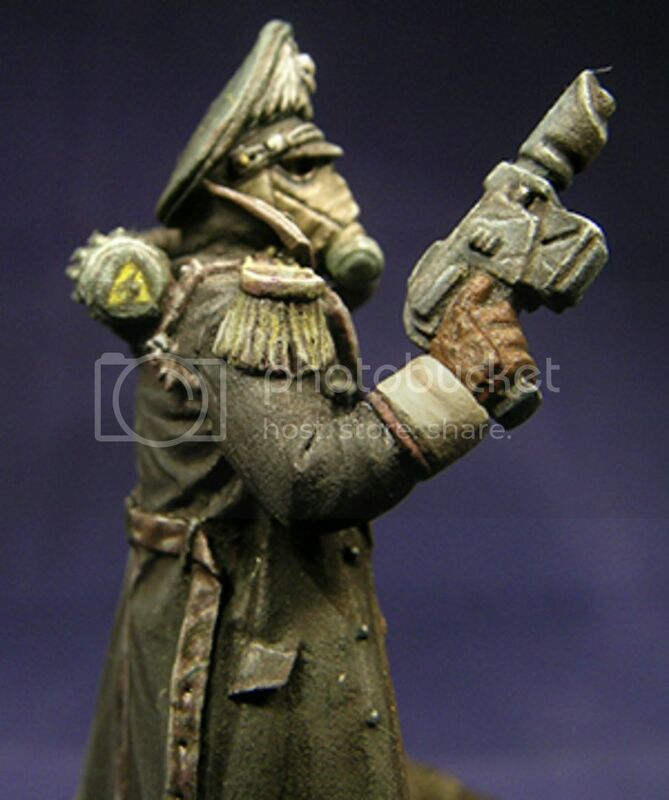 Here are the final pics of mine Kriegskommander figure. It's 28mm and casted in resin to a very high standard. As always all is painted using acrylics, inks and pigments. 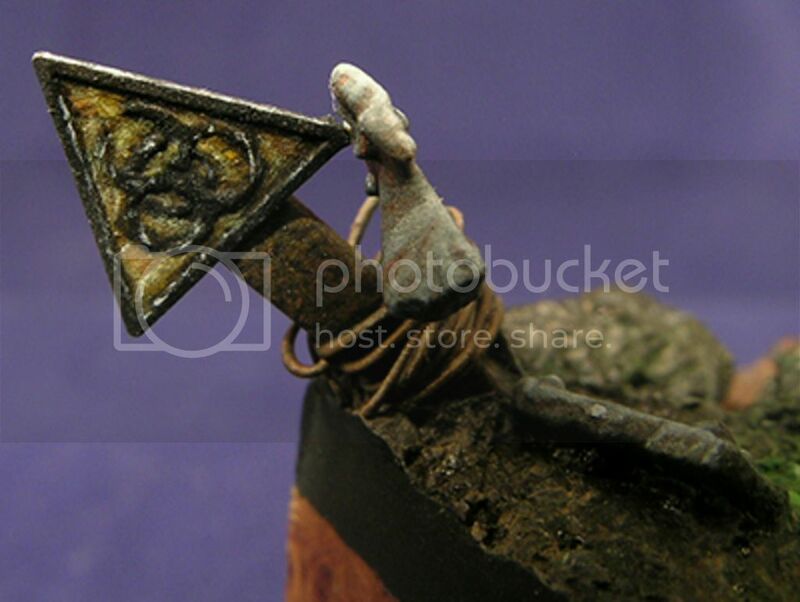 The base was build up of pieces of corck. Over this went a layer of Magic Sculp and pigments. The toxic warningsign is a p.e. part by Aztech. 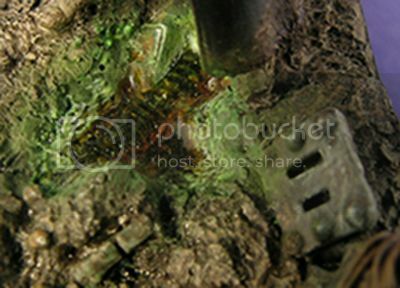 Other parts are made from spare parts of a Panzer III or IV (don't know exactly), some Evergreen porfiles and some copper wire. On this figure I tried to create an OSL effect, and as you will see I need to learn a LOT on this field. Also the NMM technique is something I don't quite get. Next figure will be back in TMM. I hope to read what you guys think of this little fella and all tips on how to improve are more than welcome. I think it looks great, loads of attention to detail and very well executed. Yep, very nice. 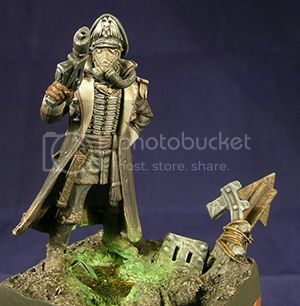 I like this mini, and think you've done a great job on him. 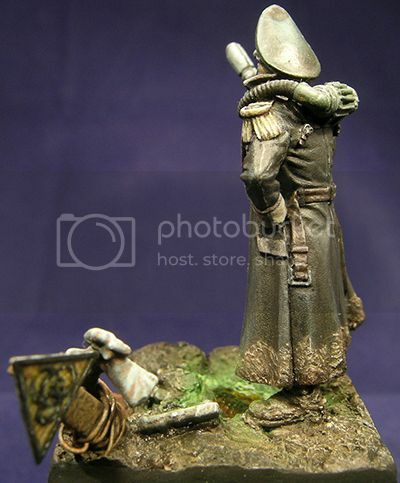 The subdued colors on most of the model combined with the green OSL give it a very dark/twilight kind of feel. I'd like to see a little bit of brightness or vivid color to somehow draw attention to his face, maybe add some 'pop' to either the goggle lenses or the canister at the nose of the mask. Thanks a lot for all the fine comments. Good point about getting more attention to the head. I'll try to do this with more highlights and extreme highlights and maybe some strategicaly placed dark shadows to make it realy pop. 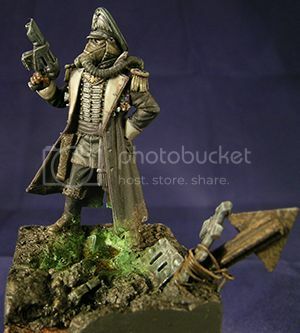 Realistic is the easiest for me; I have been painting military/historical figures for over 15 years. I'm now trying to paint as much different things and styles as paossible. Just to challenge myself and keep things interesting and makes me have to think about things. And of course loads of new techniques I hope to learn and even more expermenting; The doopest fun one can ask for!!! Here's a pic of an early stage of the face painting. here I still had to do high highlights, dark shadows, make some smoother transitions and have a variety of glazes on the face. teeth and lips aren't finnished either. By the time you read this, this had all by done (the hat too) and I hope to take and post pics on how it looks now shortly. Please let me know what you think of it and what I need to improve/cha,ge and how to do that. I'm loving this face !!! I always am in agreement when green and red(even desaturated tones of green and red) . All or any orcs,goblins etc will ALWAYS HAVE this combo. Again this kind of tonal variation using color compliments adds that sense of realism we talk about,as oppose to just adding darker greens etc.great stuff thus far keep EM going cause this is about to break the dopeness scale!!! I like the Kriegskommander vignette. Nice use of space and, as khavor said, the eerie green light helps create interest to a largely uniform-looking piece. Nice! I also like where you're going with the goblin pirate(?). He's already got a lot of character. I might turn up the red glazes in the right (his right) cheek to match the other.